It’s probably the most important day of your life, so preserving your bridal bouquet is a great way to create a memorable keepsake. You’ll need to plan ahead if you want to dry your bouquet since it’s best to do this the day immediately after your wedding. 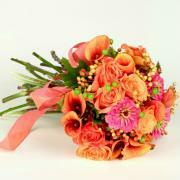 By doing this quickly, you’ll be able to maintain the vibrant colours of your bouquet. Make sure you have all your supplies ready. Here’s what you’ll need: Silica gel (you can find this at craft stores), acrylic spray (the clear type), hot glue gun, shadow box, background fabric or mat, soft artist’s brush, your bridal bouquet and your wedding announcement or photo should you choose to include these. When choosing your shadow box, keep in mind what other things you may add to the display to determine the size you’ll need. To get started with the drying process, keep in mind that the more heat you apply, the more shrinkage will occur. Begin by covering the bottom of a container with about 1 inch of silica-gel. Next, place your flowers in face up, not letting them touch each other. You will then completely cover the flowers with the gel. Seal the container using the lid or Saran wrap so it is airtight and leave it for 5 to 7 days without disturbing. Now you will gently remove all the silica gel by slowly pouring it out. Using the soft brush, dust off any gel that remains. Spray the entire thing with acrylic spray. This will seal in the colours and help keep it from breaking. Let it completely dry. Glue the fabric or mat you chose to the back of the shadow box. Then glue the flowers to the mat/fabric. This is where you can be as creative as you want. You may decide to add in a photo or your wedding announcement/invitation or other mementos from your wedding. Also be sure to consider how you will display your keepsake. For example, whether you want a straight on view or a side view if you’re displaying the shadow box as a wall hanging. Now you’ve completed your project and it’s ready to display. You’ll have a lasting reminder of your happy day in addition to the traditional wedding photo album. Category DIY Flowers | Tag bridal bouquet preserving, preserving your bridal bouquet | Bookmark the permalink.